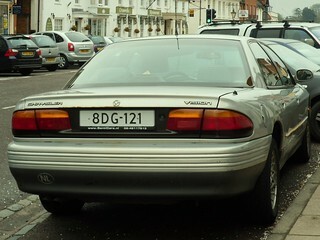 1990s Chrysler Vision 3.5 Saloon. Not the norm to spot on my doorstep, I will admit, it was also parked a lot longer than the parking enforcements allow, but escaped a ticket. Certainly not a car I really had any knowledge of before I saw this one, 90s American saloons never really did get imported over here in any decent numbers, the appeal factor of those made in the 70s and 80s having long gone by the time this one was built. That's not to say I don't like it however, the styling was rather neat, European influences a plenty.